This week all of Koru 1 have been getting creative. We have been designing our own island maps, full of exciting places and features. Each of our maps are the setting for an adventure story we are writing. Literacy groups with both Mr K and Mrs Harris have been learning about what makes great narrative stories, exploring ideas around plot, characters, and of course, setting. 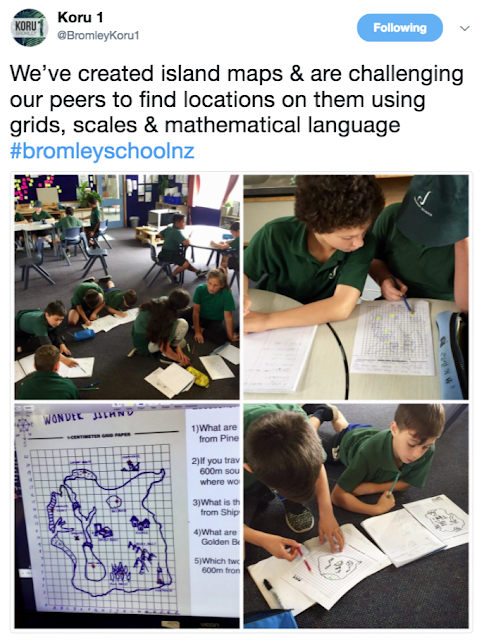 Linking with this art/writing project, Mr K's maths students have also been learning all about mapping and coordinates this week. Some things we have been finding out about are compass points, grid references and scales. Today we drew another simple map with various named locations, including a compass, grid references and a scale, then had our peers find locations on the map with clues we gave them. We will be doing some more investigations involving geometry and measurement this term, so keep an eye on our individual blogs for our personalised learning reports!